In the new movie, "Birdman" Michael Keaton is a fading, egocentric movie star who gained renown as the black-winged comic book hero Birdman. Westport News film critic Susan Granger reviews the new movie, "Birdman:"
In an astonishing technical achievement, director Alejandro Gonzales Inarritu ("Babel") films this satirical backstage comedic drama in what looks like one long, continuous take, transcending time and space, soaring off into hallucinatory flights of fantasy, while remaining grounded in the present. Michael Keaton is Riggan Thomson, a fading, egocentric movie star, who gained renown as the black-winged comic book hero Birdman. Now he's determined to prove himself on Broadway by directing and starring in a self-financed adaptation of Raymond Carter's short story, "What We Talk About When We Talk About Love." Facing mounting adversity during previews, Riggan must not only cope with his just-out-of-drug rehab daughter (Emma Stone) and embittered ex-wife (Amy Ryan), but also his harried lawyer/manager (Zach Galifianakis), actress girlfriend (Andrea Riseborough), insecure leading lady (Naomi Watts), and her supercilious actor/boyfriend (Edward Norton). What makes Riggan delusionary is the voice of Birdman, as his alter-ego, firmly lodged in his brain, enabling his mystical telekinetic powers. 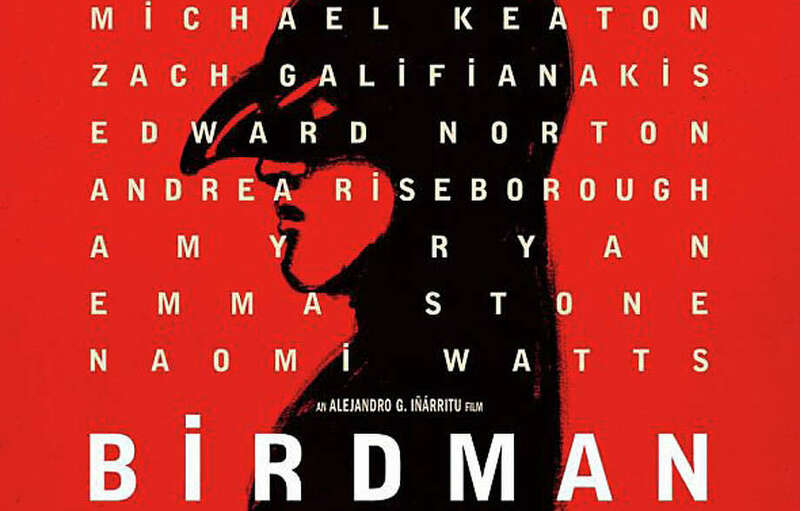 Essential to this thought-provoking character study -- co-written by Inarritu, Nicolas Giacobone, Alexander Dinelaris Jr., and Armando Do -- are Emmanuel Lubezki's fluid cinematography, and Douglas Crise & Stephen Mirrione's seamless editing, propelled by Antonio Sanchez's percussion-based score. It's restlessly paced, if inexplicable. This is the peak performance of Michael Keaton's career, ironically skewering fellow actors who have succumbed to the narcissistic lure of our culture's celebrity-obsession, donning superhero costumes and cashing big paychecks. If you recall, Keaton played the title role in Tim Burton's "Batman" (1989) and its sequel "Batman Returns" (1992). Plus, there's a strong supporting cast, including Lindsay Duncan as a venomous yet influential theater critic who vows to sabotage Riggan. There are celebrity in-jokes and sly digs at the subversive role of social media in today's world, embodied in a small card on the mirror in Riggan's dressing room: "A thing is a thing, not what is said of that thing." On the Granger Movie Gauge of 1 to 10, "Birdman" soars to an intense, immersive 10. It's an exhilarating visual experience for those who enjoy highly imaginative cinema.